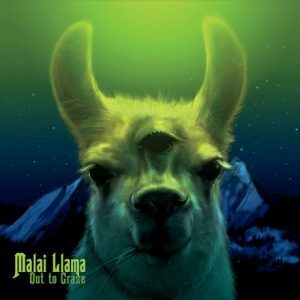 There’s no shortage of local jam bands in Colorado, but The Malai Llama seems to be among those leading the pack lately. The Nederland-based quartet recently headlined the Fox Theater with Mike Travis of The String Cheese Incident and EOTO, as well as playing the Beanstalk Music & Arts Festival in Westcliffe and nearly every small-town bar and brewery on the western slope. They’ve shared stages with huge names like George Clinton & Parliament Funkadelic, Blues Traveler, and Trey Anastasio Band. Despite having played live shows for well over five years, “Out To Graze” is their first ever studio album, which they released in their hometown of Rollinsville last Halloween. What separates them from jam bands of old is the plethora of effects, tempo changes, and synth patterns that you just won’t find in anything with Jerry Garcia or Jon Fishman’s name on it. A good example of this is on the second track, “Allocamelus,” which opens with slow, steady funk before transitioning to dizzying unison triplets. The funk jam speeds up and introduces turntable scratches (!) that you’d be hard pressed anywhere else among bands in this genre. Next comes an instrumental break highly resembling Blondie’s “One Way Or Another” plus chimes, a siren, then more fast funk with the track’s name repeated as a one-word chorus in between unison hits. Confused yet? To map out every song in this manner would take several paragraphs, and that’s what makes them so fun to listen to. You’ll hear a lot of the same pandemonium, short choruses, scratches, and unison stabs in “Stout,” but with less soloing. “Crazy on Contra” may be the only song that stays consistent in tempo and chord progressions, making it one of the danciest tracks on the album. Speaking of dance music, the “four-on-the-floor” drumbeat and rhythmic guitar licks that accompanied them on “Cockeyed,” “Gentle Giant,” and “Mahallama” felt overused. Everything else is about these songs feels unique and distinctive, but employing less repetitive rhythms would elevate their originality even more. The dreamy rock passages and fast-paced breakbeats in the ten-minute finale song, “Waking the Life,” gave it a different sound from anything else on the album. The energetic guitar solo at the end is a fitting conclusion and feels appropriately climactic. The best thing about this album (besides the three-eyed llama on the cover) is the dissimilarity between all seven songs. The electronic patches, unexpected tempo changes, and intermittent vocals are all catchy enough to be stuck in your head for a few hours, but never placed formulaically. Any audience that appreciates chaotic dance music will dig the overall technical nature of Out to Graze. Want to hear for yourself? Check it out here. You can catch The Malai Llama next at Denver’s Globe Hall on Friday, October 28th with KingFriday the 13th and Intergalactic Peace Jelly.